I am a firm believer that you can put too much information into one of these toy reviews. Long rambling paragraphs explaining every inane detail about a fictional series’ mythology just serves to make your eyes glaze over and get you to hit the back button. So I will give you a simple explanation of the Saint Seiya series and if you really must know all about everything you can go to Wikipedia and read till your eyes bleed. This is the title character of the series, Seiya. In the first episode we see him competing with many others for the right to wear the Pegasus Cloth and obviously he wins, thus kicking off the series. 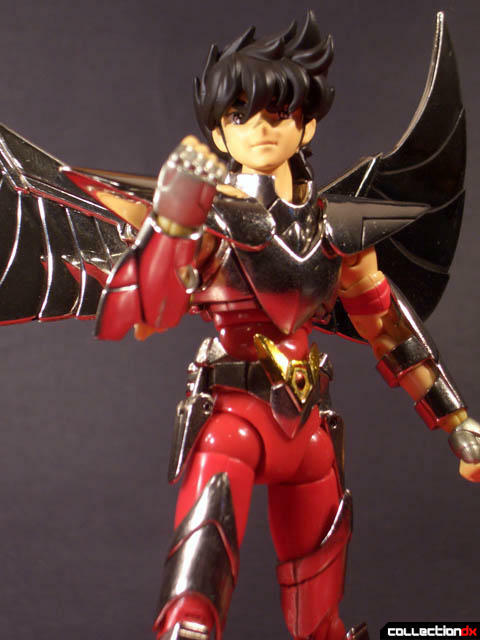 This is Pegasus Seiya as the Cloth appears in the OVA follow-up Hades-Sanctuary. All of our main characters Cloth’s (armor’s for the layman) get damaged and then repaired several times during the series. It takes a Saint’s blood to repair the cloths and as the series progresses the higher level, “Gold” saints aid our heroes by donating their blood to repairing and enhancing the “Bronze” Saints armor. By the end of Sanctuary Seiya’s Cloth can form wings. I’ll be honest, I have finished the whole TV series but at the time of this article I have not started the OVA yet so I can’t give you more detail than that right now. By next review I should be done watching the whole of the series. 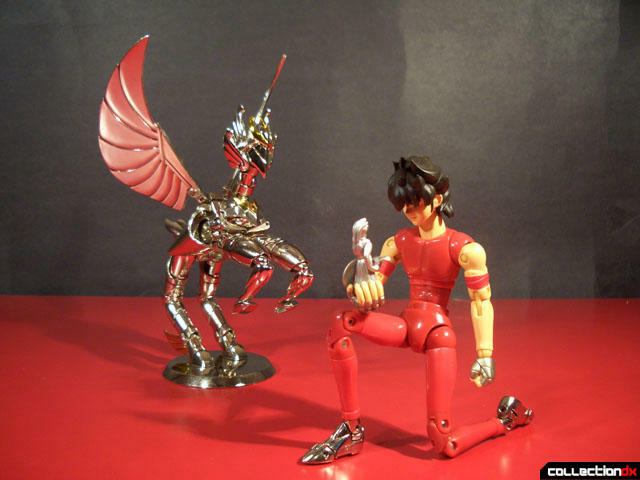 As you can see from the pictures, the Cloth does form a statue of a Pegasus when Seiya is not wearing it. In the series the Cloth’s appear to shrink so the Statue tends to be smaller but for this toy it trades anime accuracy for a sharp looking toy. It’s very shiny and looks sharp on the shelf. They also include a small statue of Athena which figures into the end of Sanctuary. The figure is plastic with lots of articulation, all the joints are nice and tight and once you have him posed he holds it very well. I have seen some report issues with loose joints on figures but so far all of mine have held their tightness very well so this has not been an issue for me. The armor is beautiful and is mostly die cast metal. With the shoulder pieces, wings, backpack, and headpiece being plastic. The feet themselves are diecast metal. Putting the armor on really gives the figure some heft. The diecast parts really have a nice weight to them. As you can see from the pictures it’s very shiny. The wings have been picking up fingerprints and don’t seem to come off very easily. I suspect the plastic parts may tarnish over time, we will see. Over all I really like this character design, he kind of reminds me Hikaru/Rick Hunter wearing armor of the Gods. I realize that Saint Seiya is not everyone’s cup of tea but I think this is one most can enjoy whether they have seen the series or not. On a side note I must say the series gets fairly compelling and I love the use of Mythology and Cosmology; though some of the early episodes feel a bit too Dragonball Z for my taste. If you haven’t tried it do not let some of the feminine character designs turn you off. The show isn’t about that and the characters are anything but girly despite their haircuts. Well…ok Andromeda Shun makes me want to slap him because he is a bit girly but other than that, the good really over rides the bad. You can get your Saint Cloth Myth figures at Angolz.com . "he kind of reminds me Hikaru/Rick Hunter wearing armor of the Gods"
In Latin america, both characters were dubbed by the same person. Can somebody explain why these are so popular? I see them everywhere and they ain't cheap, but people buy every one of them. Why are men buying these when SOC Walker Gallia goes into the discount section? This isn't a personal attack or dressing down of the toys. They look well made and they undoubtedly sell well, I'm just amazed how well. On CollectionDX, no racist, homophobic, anti-semitic, or any other forms of hate-language will be tolerated. No, this post isn't to single out duke togo or anyone else in particular, but using "gay" to refer to anything effeminate (let alone "bad", etc.) constitutes offensive language and we have no qualms about editing or deleting posts, or banning users altogether. We're not your parents. Please use some common sense when posting. Remember that CollectionDX is one of the most active English-language sites on the web devoted to these kinds of toys. Please consider that someone on the other side of the planet may not share your colorful views or language. Let's keep it clean and talk toy, folks! but did you even bother to watch the show??? And if you think it girlish, did you know that the characters desings are made by Shingo Araki, the same person who did characters desings for Grendizer and Yamato? Are you saying those shows are also girlish? Really good review Atom!! I can't wait to see myth seiya in his god cloth. Hopefully we'll see gold saints reviews soon. Is this durabe/ fragile and how well does the armour attach and stay in place?